JoJo's Bizarre Adventure is one of the most recognisable and longest running manga in Japan — there are currently over 100 volumes in print. 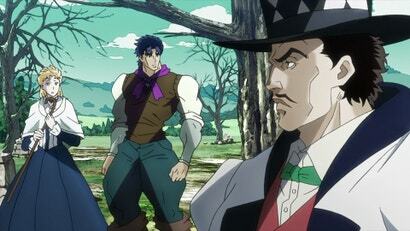 So it's no surprise that there is a new JoJo's Bizarre Adventure anime airing this season in Japan. Starting back at the beginning of the story, this anime is set to cover the first two generations of the story — first the life of Jonathan Joestar, and later his grandson Joseph Joestar. Though the anime is ongoing, the first arc of the story wrapped up back in December. It is an incredibly faithful adaptation of the manga, but, unfortunately, that also proves to be quite the double-edged sword. 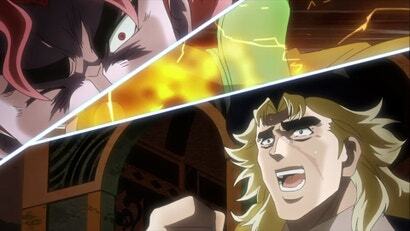 When it comes down to it, JoJo's Bizarre Adventure is very true to the source material — so much so that it is often frame for frame, line for line the same as the manga. If you have a favourite fight or favourite scene in the manga you would like to see in animated form, the chances are quite high you'll get your wish in this anime. 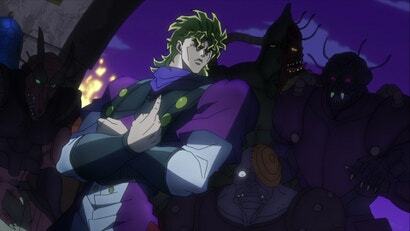 This even includes the stylish Jojo poses the series is famous for. One of the best things about seeing this story animated is the addition of colour to the black and white of the manga. Rather than standard shading, the anime uses a lot of solid colours — making everything look vibrant and almost pop off the screen. It also uses colours to accentuate the more shocking elements of the story with abrupt changes to the colour palate. But the best use of colour is when the supernatural elements come into play. These supernatural scenes happen exclusively in dark places or at night; and with the use of bright solid colours attached to explosive special attacks, the darker the anime gets, the better it looks. This is an anime that begins with the telling of a story of two boys — one rich and kind, the other poor and evil — growing up together in Victorian-era England. By the time it ends, it's about the two of them fighting to the death — though one is now a vampire controlling thousands of zombie minions and the other a mystical martial artist who can fill his punches with the equivalent of sunlight energy. In other words, the first arc of JoJo's Bizarre Adventure is more than a little random in its plot twists — which is guaranteed to excite some of you and completely alienate others. Above I stated that this Jojo's Bizarre Adventure is very true to the manga — which is also one of the anime's greatest faults. Because there is a lot to get through in order to finish five manga volumes in just nine episodes, it seems to be blowing through the story at max speed. But as rushed as it feels, at the same time it almost seems to take too long. It is crammed full with details from the manga. Every spare moment is spent dumping information and series lore onto the viewer. The anime just goes non-stop and never takes time for us to catch our breath. What's even worse, though, is how and when we get these information dumps — which is to say, often in the middle of a fight. More often than not as the series goes along, those not directly involved in the current fight give a running commentary of what is going on — explaining in detail every attack and counter attack. Firstly, this destroys the pace of the fight because we have to switch away and focus on the commentators after practically every move. It is done so often and feels so out of place that it almost seems to be a parody of both its own manga and other fighting manga — where people can easily have an entire conversation between one punch and the next. Secondly — and more importantly — anime is a type of visual storytelling. We should be able to see what is going on — not be forced to have every single detail of every fight explained to us verbally just so we can follow what is happening. 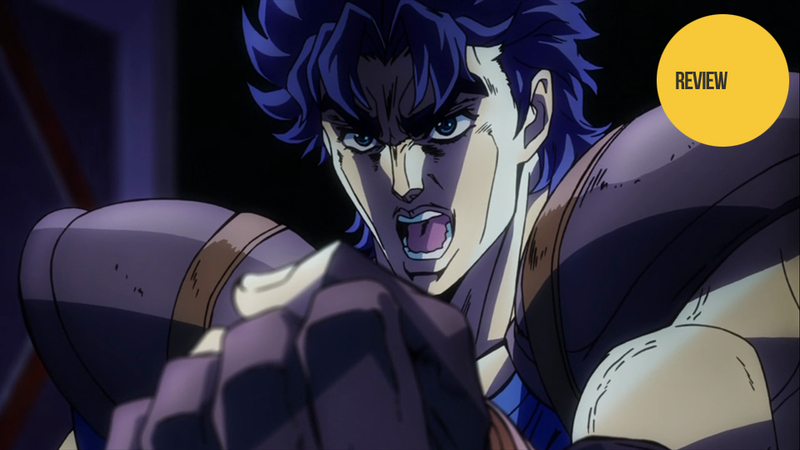 In other words, if I see Jojo's arm suddenly frozen upon punching the villain and then see with his next punch that his special attacks aren't working, it is obvious what is going on. I don't need it explained step by step. Any outstanding questions can be answered when the battle is finished. This first arc of Jojo's Bizarre Adventure was very much a mixed bag. It has an excellent art style and fans of the manga will no doubt be pleased with how faithfully it follows the source material. However, this is one anime that would have benefited by a bit more freedom to properly adapt to an animated format. That said, it is still a decent introduction to the massive franchise that is Jojo's Bizarre Adventure and is certainly worth a watch for anyone interested in trying the series. Now, the only question that remains is if the second arc of the story — which has 15 episodes to cover 8 volumes — will be able to correct the shortcomings of the first arc. 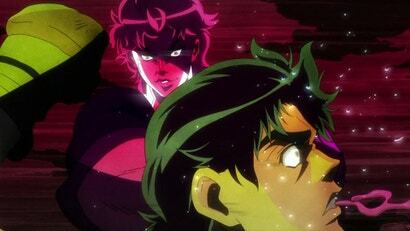 Jojo's Bizarre Adventure is currently airing in Japan on Tokyo MX. It has not been licensed for Western release. However, for those interested in importing, the Japanese Blu-rays will come complete with English subtitles as they are released over the coming months. Come back in a few months to see our Kotaku East review of the second arc of Jojo's Bizarre Adventure. That's entirely your fault for using gg when they are troll subbing. This Anime is amazing. My Anime of the season. Watched the first arc at my local anime club (check your listings! :p) and much fun was had. Roll on the next arc.